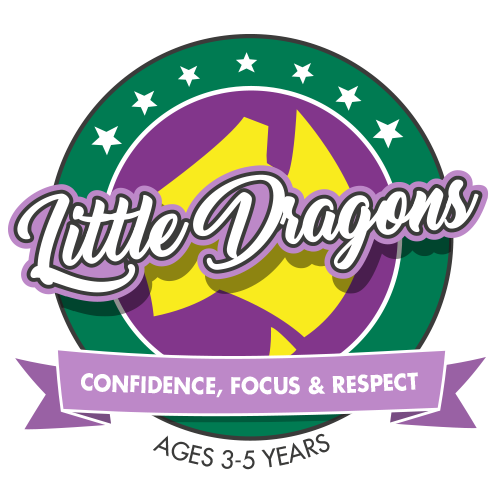 The Little Dragon’s program has been developed to help your three, four or five-year-old child develop self-control, respect, manners and confidence all while having fun and making new friends.The curriculum is designed with a new theme every week discussing age appropriate life skills around confidence, focus, following instructions, health, bully busting and stranger awareness, all of which are in line with your child’s age based developmental milestones. Class content is developed by our Exercise Scientist and Masters of Education specialists in line with the physical and emotional skills that this age group need to develop. Classes have a component of fitness, flexibility, co-ordination, strengthening exercises and meditation. Clear outcomes are met in order to progress through the Little Dragons belts to set your child up with a great foundation in the sport of Taekwondo and Self Defence. 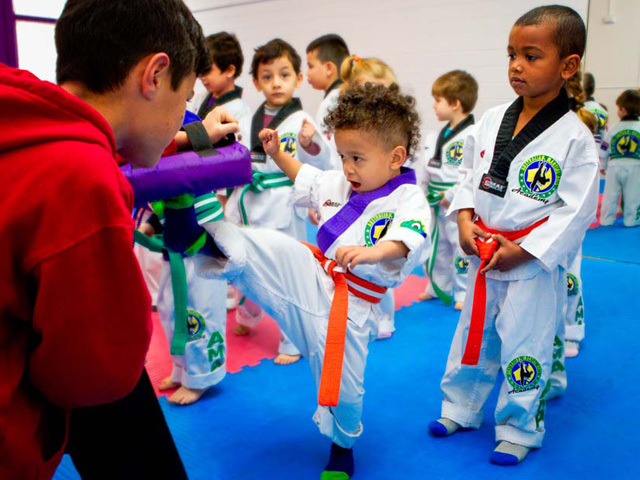 Our students learn far more than kicking and punching. Here the teachers encourage students to learn their phone number, make their bed, introduce themselves, be respectful of others and be aware of their surroundings and body. Little Dragons will learn about eating right and the importance of learning to take care of their body and mind from a young age. Our dedicated team is ready to make sure that your child is set up for success. Please view our comprehensive timetable to check the latest classes for your age group! Classes run for this age group 7 days per week. Each class is 30 minutes long run out of our Full-Time Marrickville location in Sydney’s Inner West. I just wanted to pass on my thanks to all the instructors that have been supportive of my son in the early months of his lessons. In particular Miss Montana and Mr Otis who have had most contact but everyone else who has encouraged him…especially when he was a bit reluctant to go in (Mr Mark had to carry him in at least once!). I think we are mostly over the hump now and Sunday morning are about excitement now. AMA is an amazing Martial Arts Academy that has transformed my 7 year old over the past 4 years. Kiki started off in the Little Dragon’s program at 3 when she was shy and lacked confidence. She now has worked incredibly hard to achieve a black belt and applies all that she learns at Taekwondo to her school and social life – she understands respect, the need for hard work and focus and learns not only Taekwondo, but also important life related skills such as self-defence, stranger danger, how to deal with bullying, leadership skills, how to become a teacher and tricking! AMA is now an integral part of her daily life and she loves being part of the great community that they have created. There are so many types of classes to choose from as well as extra curricular events, such as Sunday Superstars, and Birthday Parties. Kiki had her 5th Birthday Party there and amazed her friends with all the skills and gymnastics she had learnt but cutting her cake with a “Samurai ” sword topped the bill! The teachers really are excellent role models that the students look up to and strive to be like. They always show care and consideration, and its never too much trouble to make themselves available to listen and answer questions and concerns. AMA was recommended to me and I am so pleased I acted on it. I enrolled my daughter almost 4 years ago on advice from a friend who knew Grand Master Ridvan through some of the pastoral support programmes he has set up for students over the years – above and beyond martial arts training. After seeing how much my daughter was getting out of the programme I decided to start as well; making it part of our family routine. As one of the least co-ordinated and sporty people in the world I was worried. From the first class I discovered not only a fantastic array of supportive and exceptionally talented instructors, but a wonderful community where students help and encourage each other. Four years (almost) on and my not-so-little girl is 7. She has a passion for contact sparring and wants to represent Australia in the Olympics one day. I love seeing how AMA has helped her discover a passion, and how the focus, self-confidence, friendship, ‘bully-busting’ and safety skills she learns benefit her every day. I, somehow, have a black belt myself, and love the fun, friendly and physically challenging classes. I am now fitter than I’ve ever been, and feeling stronger and happier in my own body. Some of our family’s closest friendships have been made and/or cemented through AMA. I remember the first time I met Master he told the class that at AMA we are one big family, and as trite as it may sound, I truly have felt that ever since. 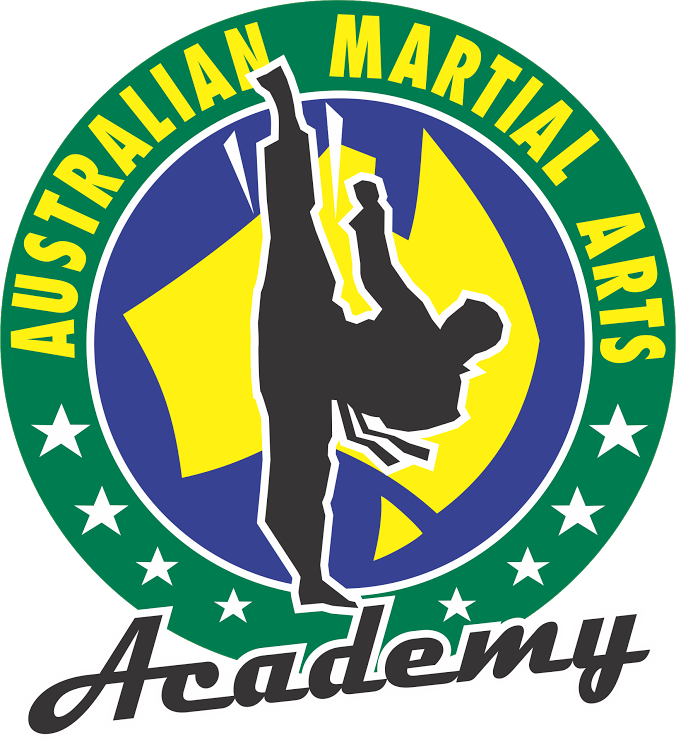 I may well be biased, but I truly cannot recommend the Australian Martial Arts Academy highly enough. 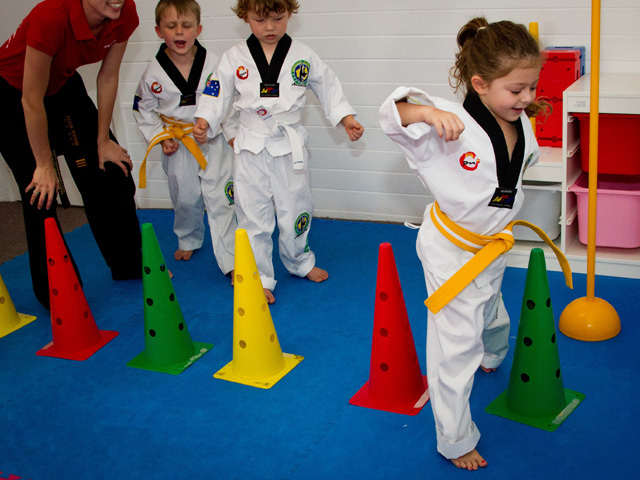 There are programmes for everyone, from 18 month-olds on; there’s tae kwon do, along with kickboxing, self-defence, tricking, leadership development and low-impact classes based on tai chi. I decided to start my son doing martial arts when he was 3. He was a big strong boy and didn’t understand his own strength so he was rough and pushed a lot and it was becoming an issue. I started Jacob at AMAA in one of the first Little Dragons classes. It took a couple of weeks for him to settle in but with the help of the wonderful Miss Sarah he was soon loving it and within a few weeks the pushing and roughness was gone. He had an outlet & understood when and how he could or should use his strength. It was fantastic! When Jacob got to school at age 5 & a half (after 2 years at AMAA) he had already learnt self discipline, focus, concentration and goal setting. He already understood the importance of learning and the pleasure of achievement. He had self respect and respect for others and he had an incredible martial arts school full of amazing role models to look up to and follow. Jacob turns 10 in 2 weeks. He has been with AMAA for 6 and a half years. Next year he will sit his 3rd Dan Black Belt exam. We have spent thousands of hours at AMAA and every time I am there I still see things that confirm for me what an amazing place it is. My son has other activities and sports but he has learnt far more from this environment than any other and all around him are children who are taking it all in and supporting each other. I could go on and on about the great instructors, the world champions, the flawless leadership of Miss Sarah, Mr Hakan and Miss Busra and the vision of Ridvan Manav (The Master) – together they have created more than just a martial arts academy. They have created a school that aims to teach our children to be safe & strong but also to be real adults, good people, hard workers, respectful community members and good role models. Oh – and they teach Tae Kwon Do and guess what – they are the best in the world!! Contact us to secure your spot in Australia’s best pre-schooler program today!